When someone comes to me to have a wedding ring made to match a ring they purchased elsewhere my first advice to that person is to have the ring made by the maker of the engagement ring. There are many reasons why and here are some. Two 18ct yellow gold alloys of different colour. There are no standard formulas for precious metals such as 18ct yellow gold. Each precious metals companies formula may vary in colour to another`s. You can see in the photo to the right that the channel set wedding ring I made on top is slightly yellower than the engagement ring below it despite them both being 18ct yellow gold. The ring at the bottom is quite old and in previous years 18ct yellow gold alloys generally had more copper in them and were slightly redder than most used today. Well.... match the gold please!!! This is an unlrealistic request that I used to hear all too often and is one of the reasons why I stopped doing repairs years ago to concentrate on jewellery I make. Know where you purchased the ring from, contact them and ask them from which manufacturer they purchased it if they did not make it. The jeweller doing the resizing would then need to go and buy that precious metal alloy just for your job. Take a sample of the gold in the existing ring (damaging it) and sending that to a precious metal refiner to ask them to reverse engineer the alloy and then create a small batch to use just for your ring. The cost would be immense. Pay someone like me to trial and error creating alloys for hours, days or even weeks until I get a match. The existing engagement ring is .8mm thin at the base. I usually make my rings between 1.3mm - 1.5mm thick for ladies rings. That means that when you put a ring I have made next to one purchased elsewhere you get this.....they do not match. I have written so many articles over the years about how jewellery is generally mass produced today to use as little precious metal as possible and this shortens it`s life. If you want to read more about this then this article is a great place to start. In order to make jewellery cheaper more machines and less materials is the formula that most jewellery chains use. The results can be very sad, disposable jewellery. The dilemma here is that if I make a new ring thin enough to match this existing ring then I am making a ring that I know will have issues. I cannot guarantee rings made to the current "jewellery industry standard", so I make them to my standards or I do not make them at all. This engagement ring is a great example of how resizing a thin ring is problematic and also highlights the problems of matching gold colour that we touched on earlier. 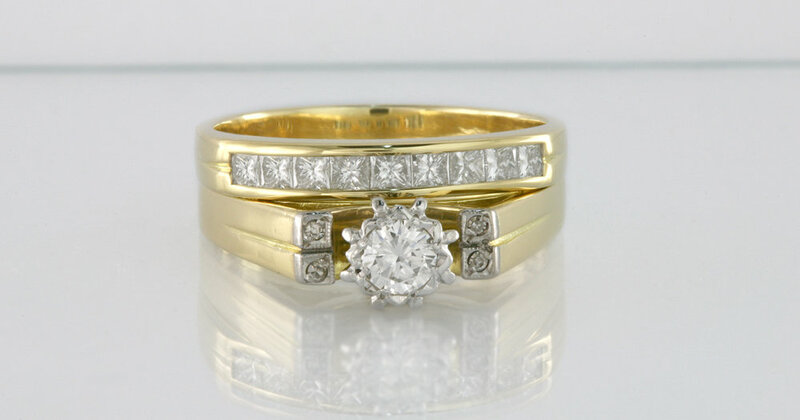 In the photo below gold colour 1 is the original 18ct gold of the ring. 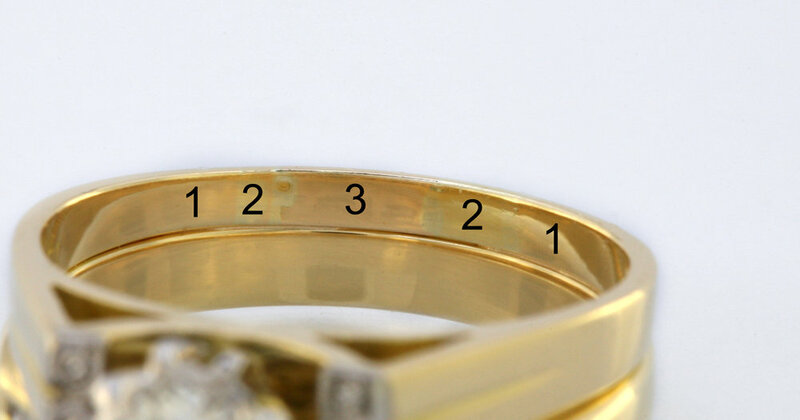 Gold colour number 2 is the different colour of the gold added when the ring was resized a first time. Gold colour number 3 is a yet again a different 18ct yellow colour that was used when the ring was resized for a second time. Three different colour 18ct yellow gold alloys in one ring. When you have a ring resized it is unrealistic to expect a jeweller who did not sell you the ring to have on hand gold to match perfectly. Take it back to where you purchased it from. Where possible whomever sold it to you should service it. I would love a dollar for every time I heard someone complain that they took their ring to a jeweller for a resize and the gold they used does not match. 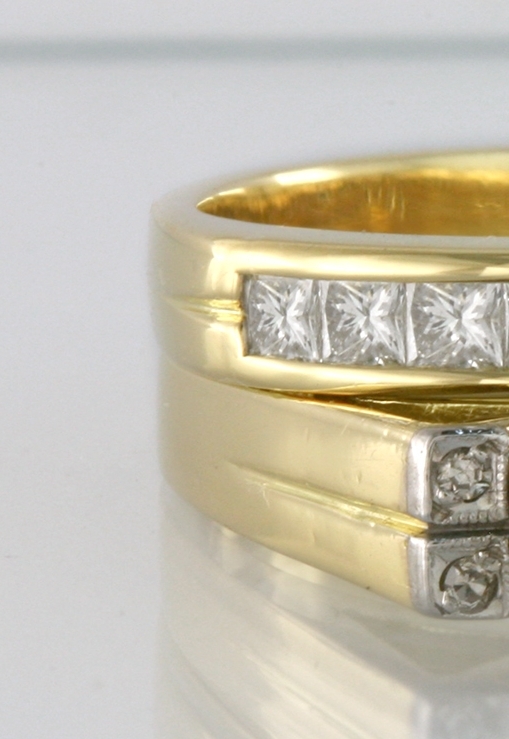 You can see in the photo above the joins in the resized ring. Gold solder is yet again usually a slightly different colour due to a different composition of the metal alloy to reduce it`s melting point. Joins in rings this thin are not very strong and this engagement ring tends to bend out of shape and was straightened before pinning to the new ring. .45 carats of channel set princess cut diamonds. 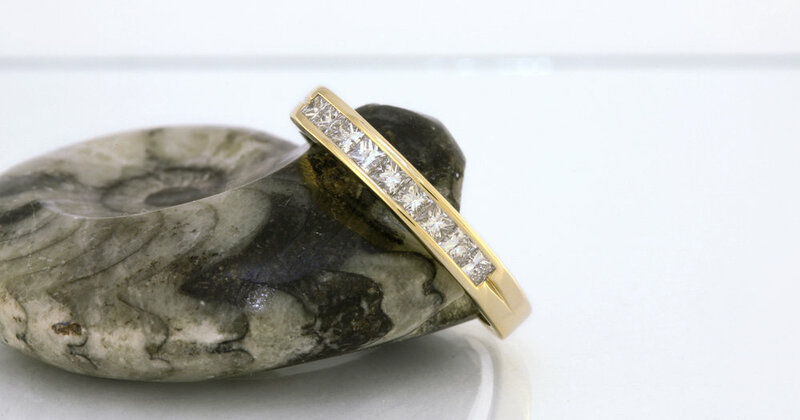 Detail in the band to match the existing engagement ring. The finished wedding ring pinned to the old ring. This article has been created because this issue comes up time and time again and takes so long to explain and is such a negative conversation to be having with new or potential customers. 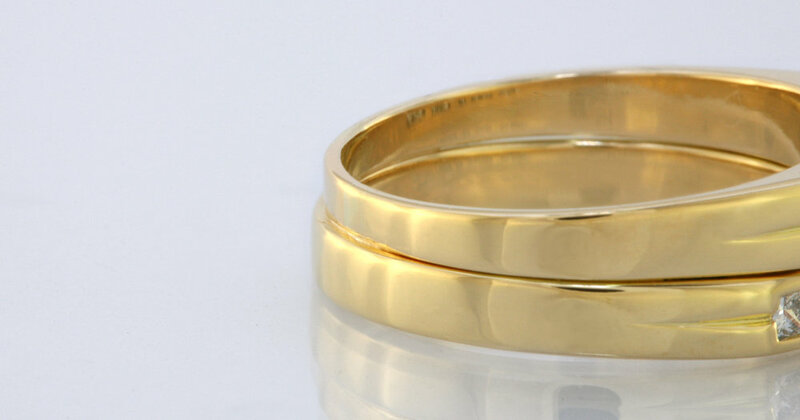 Hopefully I have explained it well and if I have sent you to this article you now know why I was so reluctant to make your wedding ring to match a ring you purchased elsewhere. We did not even touch on how important it is to plan for the wedding ring when you make the engagement ring. So why did you make this ring? I agreed to make this ring for this longtime customer because he knows me well and that it would be either my way or not at all. I was not going to make the new ring to match. I don`t make disposable jewellery.